The Goldtouch Wireless Ambidextrous Mouse features a classic look and is designed to fit a wide variety of hand sizes and grips. 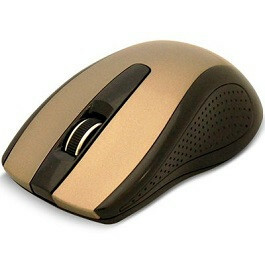 Most importantly, the mouse sits comfortably in either the left or right hand, allowing for ambidextrous use. Getting started is easy. Plug and Play wireless technology allows you to quickly pair the mouse with your favorite PC or Mac device. And with 1000 DPI sensitivity, cursor control has never been more precise. In addition, the Goldtouch Wireless Ambidextrous Mouse is equipped with 2 AAA batteries, which equates to 6-8 months of battery life with typical use. System Requirements: Windows XP Windows Vista Windows 7 Windows 8 Mac OS X 10.2 and later Dimensions: Length – 4 ½ Inches Width – 3 1/8 Inches Height – 2 inches at the thumb, 1 inch at the small finger Weight – 4.7 oz.